Across the nation, 56 million students are going back to school. In the Southland, to prevent traffic-related injuries and fatalities to students heading back to school this month, the Automobile Club of Southern California and safety advocates urge drivers to slow down and stay alert in school zones and neighborhoods around schools. The afternoon school hours are particularly dangerous for walking children. Over the last decade, nearly one-third of child pedestrian fatalities occurred between 3 and 7 p.m. In 2016 alone, across the U.S., there were 373 child pedestrians and 85 bicyclists were killed as a result of motor vehicle crashes, according to the National Highway Transportation Safety Agency (NHTSA). That same year NHTSA also reported that one of every five children under age 14 who were killed in traffic crashes were pedestrians. In California, 40 pedestrians and six bicyclists under 18 years old were killed. 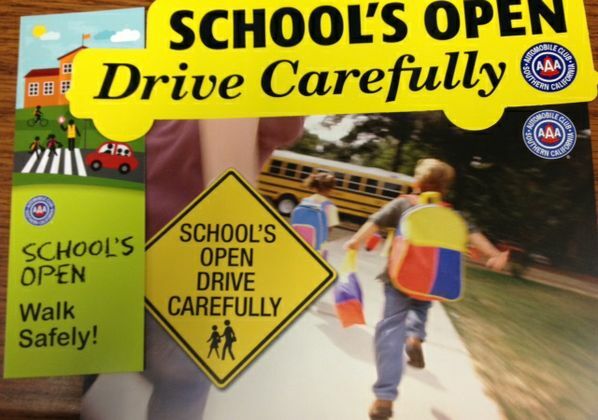 The Auto Club’s School’s Open – Drive Safely traffic safety awareness campaign includes distribution of more than 500,000 pieces of traffic safety materials to elementary, middle and high schools, law enforcement and community groups in its 13-county service region. New materials urge motorists to not drive “intexticated” and to slow down in neighborhoods and school zones. Talk to your teen. Car crashes are the leading cause of death for teens in the United States, and more than one-quarter of fatal crashes involving teen drivers occur during the after-school hours of 3 to 7 p.m. Get evidence-based guidance and tips at www.TeenDriving.AAA.com. Watch for bicycles. Children on bikes are often inexperienced, unsteady and unpredictable. Slow down and allow at least three feet of passing distance between your vehicle and the bicycle. If your child rides a bicycle to school, require that they wear a properly fitted bicycle helmet on every ride. Find videos, expert advice and safety tips at www.ShareTheRoad.AAA.com. Schools and community groups can request an Auto Club Traffic Safety Materials catalog describing available educational brochures and tip cards, programs and safety initiatives by going to www.AAA.com/schoolsafety. To learn more about pedestrian safety, please visit www.AAA.com/safetytips. For more information, email publicaffairs4@aaa-calif.com.